Sometimes I hate being right. Back in October of 2017, Aireene Espiritu and I were trying to find a way to get her to Memphis for a proper debut (I never count Folk Alliance appearances since they don’t let anyone in or out of the hotel). She was heading this way the following September, and I was wary. September is to Memphis as Saturnalia was to the Romans – a desperate attempt to escape an unending season by filling every waking moment with festivals and concerts and general merrymaking. I swear every year that I’m not going to book shows in September and then somehow I end up with two of them, because when talented touring artists from afar are making a rare pass through Memphis, I just can’t say no. So when we ended up with a modest pre-sale list for Aireene’s show, I wasn’t shocked, but I still felt bad. It had been a while since we’d struggled to bring a big group together and it felt like a failure, but what I forgot is that the size of the audience doesn’t really matter. In fact, those more intimate crowds have a magic all their own. 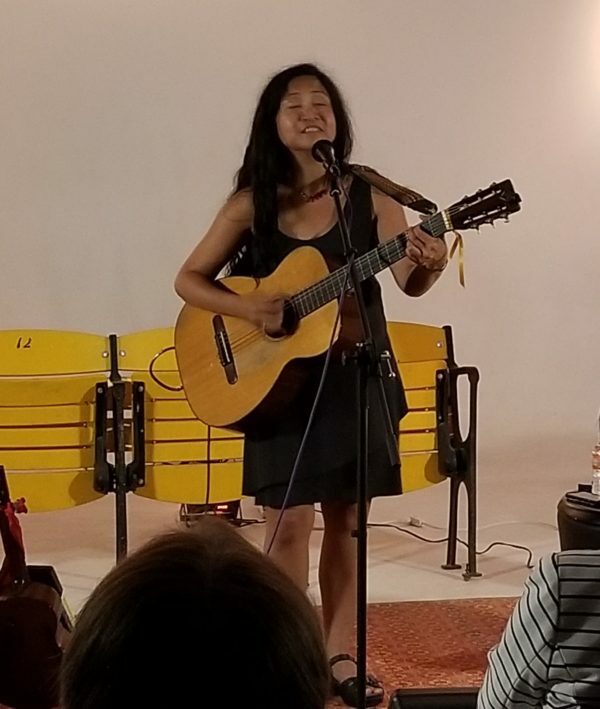 Of course, Aireene Espiritu is such a lovely and giving human that I’m sure she would have happily performed for an audience of one (and, like more touring artists, actually has), but we had a nice little collection of folks gathered. For as hectic as that week felt, her show was an island of peace. Alternating between her guitar and tenor ukulele, Aireene played one extended set that flowed between her own compositions and inspirations from Sugar Pie DeSanto to Big Jay Neely. She treated everyone in the audience like a friend being welcomed into her home, and she built our connection with each other through her warmth. Of course, you should never underestimate the quiet ones. Aireene’s work tackles tough subjects like the execution of young black men in America and the struggles of homelessness. She just handles all of those issues with her own graceful touch and clear-eyed truth. So no, it wasn’t the packed room Aireene Espiritu deserved, but it was still a gift to everyone there. We took in her words and melodies and felt the heart shift that happens when someone shares her deepest self so beautifully. 100% of ticket sales for each show go to our artists. Yep. All of it. So if you want to help produce these shows and get access to behind-the-scenes extras, become a patron for as little as $2 a show.